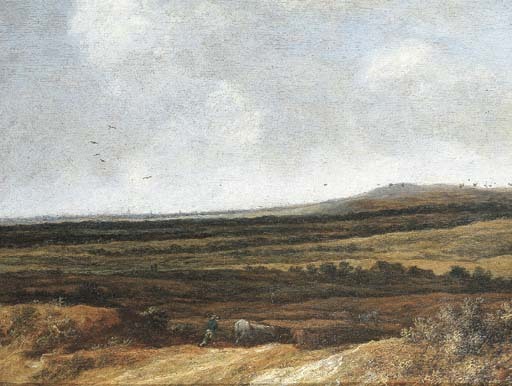 Baron L. Janssen, Brussels; sale, Frederik Muller, Amsterdam, 26 April 1927, lot 104, as Salomon van Ruysdael (fl. 950 to G. Horemans). Anon. Sale, Christie's, London, 23 July 1982, lot 143. Anon. Sale, Sotheby's, London, 30 November 1983, lot 233. Anon. Sale, Sotheby's, London, 30 October 1985, lot 32. We are grateful to Dr. Hans-Ulrich Beck for confirming the attribution, on the basis of a photograph. In the 1927, 1955 and 1982 sales, the composition included some windmills to the rear and left; these seem to have been removed at some later point, perhaps as later additions.